Alright, it's official: I love this series. Visiting McGuire's Wayward Children series is like finding my door. No matter what world she takes us to I'm entranced by how distinct and vivid each one is and how they come to life. Getting to see Nancy's Halls of the Dead was a beautiful treat, and the world of Confection was so richly described I could smell the sugar. There is also something delightful about a bunch of "logic" characters, and fairly goth ones at that, wandering through a "nonsense" candy land and disliking it immensely. It was great getting to know Christopher more, and I was thrilled to get to spend more time with Kade, whom I adore. If there was one thing about this book that didn't wow me it was that so much of it was from the perspective of a new character, Cora. I just wasn't terribly invested in her, and I wish less emphasis had been put on her identity as "the fat girl." I get what McGuire was doing, by trying to emphasize that there is so much more to her than her weight, but by pulling it constantly to the foreground some of that work was undermined. One of the things that's great about this series is the diverse cast, and Cora fits in nicely in that way, but the other identities aren't harped on in the same way (which is good). So yes to characters with larger body types, but no to constantly pointing it out. It's nit-picky of me, to be sure, but when the rest of the book was so wonderful it stood out. If you've ever enjoyed portal fiction you owe yourself these books. They are truly gems. I just hope McGuire writes many many more over the years. I'm already looking forward to the next, and this one hasn't even been released yet. Thank you to Tor for the review copy! 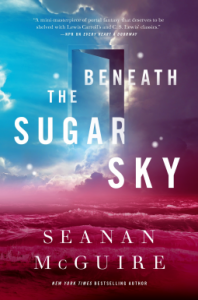 Beneath the Sugar Sky hits bookstores on January 9th, 2018.